During the record-breaking winter of 1933–1934, when temperatures in Northwest Connecticut went more than twenty-below zero, the Northern Litchfield County Council conducted its annual financial drive. Even though the economy was as hot as the outside temperature, the council was able to gather enough funds to open Camp Workcoeman for five weeks. This was one more week than in the recent depression years, but still one less week than the prosperous 1920s. The council camping committee hoped that the extra week would relieve some of the crowding, but when the season opened, Workcoeman was at capacity. Years before, the size of the dining hall set the capacity at forty-four, but during the third week of camp, sixty-two scouts attended. With the knowledge of some money on hand and several consecutive high attendance seasons, the council could commit to a dramatic expansion of Camp Workcoeman. Even if the economy continued its slow march to recovery, it would not be easy to raise the funds. The council would have to keep its regular expenses down and save the surplus for several years. While Jennie Coe was a driving force behind the Scout Mothers' Auxiliary’s effort to expand Workcoeman, she did not live to see the new dining hall. During the fourth week of camp, she fell down a flight of stairs at her summer home on Bantam Lake, dying in the accident. Camp Workcoeman’s trustees and Council Executive Edward Jacot served as pallbearers at the funeral. As Jennie Coe was lowered into the grave, beside her husband Frank, an honor guard of Scouts gave her a final salute. 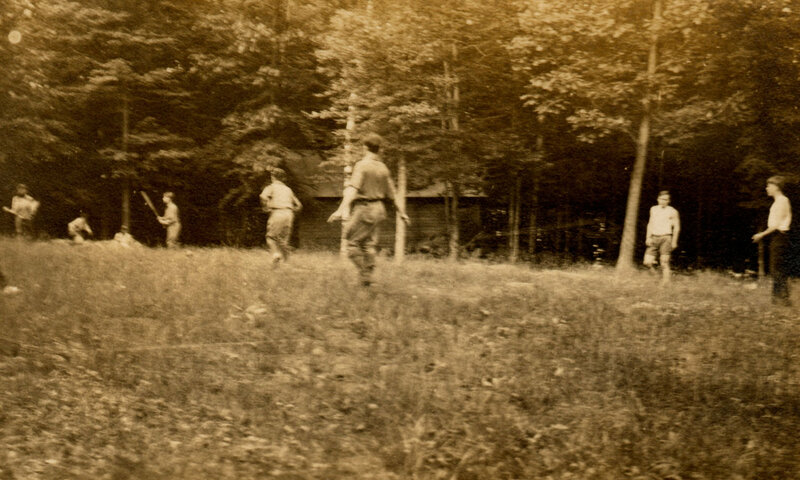 The image below shows Scouts from Troop 2 playing baseball on the parade ground in the middle 1930s.